Timothy P. Masterson D.D.S., P.C. leased 2,396 SF of office space in the Foxridge Medical Building at 8120 S. Holly Suites 208 & 208A for 5 1/2 years. Matt Kulbe of NavPoint Real Estate Group represented the landlord. This lease was executed in April. Midwest Testing, LLC leased 1560 SF of industrial space in the Grand Garden Center at 944 Elkton Dr. for 3 years. 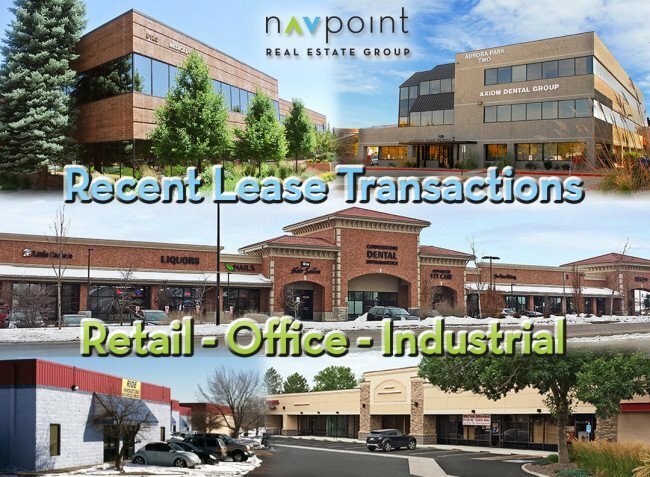 Jason Liesegang of NavPoint Real Estate Group represented the tenant. This lease was executed in April. Trumpet Behavioral Health, LLC leased 3,180 SF of office space at 1230 Tenderfoot Hill Rd #305 for 3 years. John Witt of NavPoint Real Estate Group represented the landlord. This lease was executed in April. Joyce E Law and Mandi Shepard leased 547 SF of retail space at 2624 6th Ave for 5 years. Matt Call and Heather Taylor of NavPoint Real Estate Group represented the landlord. This lease was executed in April. Law Offices of Jason W. Jordan, LLC leased 2,748 SF of office space in The Quadrant at 5445 DTC Parkway #910 for 7 years. Matt Call of NavPoint Real Estate Group represented the tenant. This lease was executed in April. Summit Partners-Colorado LLC leased 1,850 SF of office space in the Valentia Building at 5347 S.Valentia Way Suite 110 for 3 years. Matt Kulbe and Heather Taylor of NavPoint Real Estate Group represented the landlord. This lease was executed in May. Stonegate Mortgage Corporation leased 1,765 SF of office space in The Valentia Building at 5347 S Valentia Way Suite #310 for 1 year. Matt Kulbe and Heather Taylor of NavPoint Real Estate Group represented the landlord. This lease was executed in April. Hulse Law Firm, LLC leased 1,153 SF of office space at 8 West Dry Creek Circle Suite 202 for 3 years. Matt Call and Heather Taylor of NavPoint Real Estate Group represented the landlord. This lease was executed in April. ReMax Structure and Brandon Rossell, Alexander Gershkovich, and Svetlana Kuznetsova leased 2,004 SF of retail space in the Bridge Center at 9233 Park Meadows Drive for 5 years. Matt Call and Heather Taylor of NavPoint Real Estate Group represented the landlord. This lease was executed in April. FixNcell LLC leased 1,036 SF of retail space in the Westbrook Shopping Center at 9140W 100th Ave Unit A7 for 3 years. Matt Call and Heather Taylor of NavPoint Real Estate Group represented the landlord. This lease was executed in April. Dawn M. Pfefferle dba Covet Décor leased 1,544 SF of retail space in the Westbrook Shopping Center at 9140W 100th Ave Unit A8 for 3 years. Matt Call and Heather Taylor of NavPoint Real Estate Group represented the landlord. This lease was executed in May.